Apple TV, App Makers Try To Move Casual Gamers To Bigger Screen : All Tech Considered In 2015, mobile games revenues are expected to hit more than $30 billion worldwide. Apple wants these casual gamers to play their mobile games on its streaming TV console. 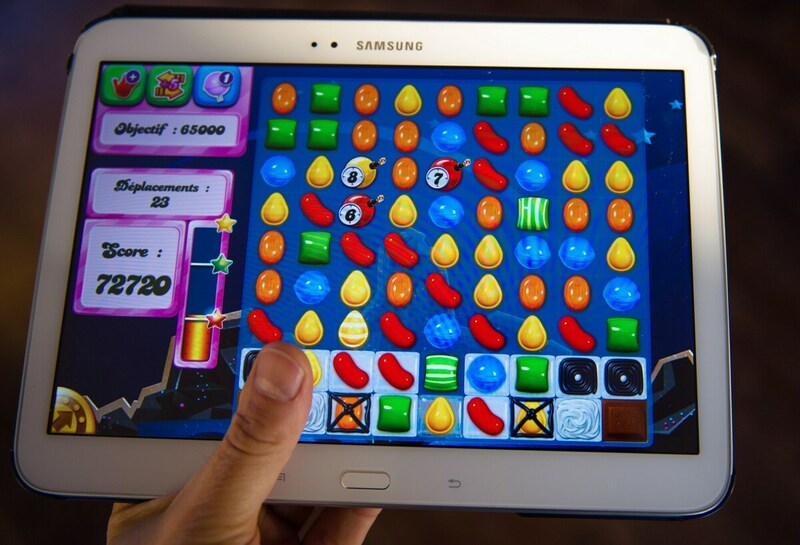 A person plays Candy Crush Saga on his tablet in Lille, northern France. This year, mobile games revenues are expected to fly past console games and hit more than $30 billion worldwide. When Apple recently updated its TV box the redesign included a remote that also functions as a game controller. Apple isn't trying to compete with powerful consoles such as Microsoft's Xbox or Sony's PlayStation. But, Apple is competing with Google and Amazon to attract a much bigger but different gaming audience. It's a group of gamers who have no interest in buying a console, even though they enjoy video games. This audience plays games on their phones and tablets, such as "Cookie Jam," where you try and match up cookies of different colors. Cookie Jam is made by SGN, a company that only makes mobile games, but its CEO Chris DeWolfe thinks he would like to try and redesign his company's games for a TV streaming box. DeWolfe says a lot of people are already playing in the living room, "and kind of paying attention to the TV, but really playing a game. But, there may be certain instances where you want to play a game with your whole family and it could be game night." There's a big reason that Apple would want to draw in game makers such as SGN to its TV box. The audience for mobile games is huge. In 2015, mobile games revenues are expected to fly past console games and hit more than $30 billion worldwide. Half of that revenue came from games in Apple's App store, according to data firm NewZoo. And mobile games are just one part of an even bigger category that analysts like P.J. McNealy call casual games, which can also be played on a PC. "Today casual games can be anything from games on Facebook to Bejeweled to whatever the latest Floppy Birds or Angry Birds are on mobile," says McNealy. McNealy says every sort of person is playing these games — not just young people. "The definition is pretty much 8 to 80 years old," he says, "and that's a big change from 10 years ago when we were probably talking about an age range of 25 to 40." Last year, the highest grossing mobile game Clash of Clans, brought in $1.8 billion. That's more than three times the gross of Hollywood's top grossing film American Sniper. "You have to go on raids and attack other villages and basically steal their resources," says Lisa Ann Colton-Fowler, a mom in Brownsville, Texas, who plays the game. "We are a three-generational household," she says. "I live with my my mother and father-in-law, and my wife and our college-age daughter." Colton-Fowler plays between work and chores and uses Clash of Clans as a way to connect with her extended family. "When we were kids we used to all sit around a table and play Crazy Eights," she says. "My cousins are all over the country and we all have busy lives. I probably wouldn't interact with them very often except maybe at family reunions, and this is just another way to play with them." Colton-Fowler has no interest in playing games on consoles like the Xbox or PlayStation. But, when I asked if her family would be more attracted to the new Apple TV because it might let her play Clash of Clans in the living room, she was enthusiastic. "I could certainly see my wife going, 'Yeah, I want that and if I get that we'll all be able to play games together,' " Colton-Fowler says. "It would be a selling point." Apple will be facing competition from Amazon and Google for the eyes of the big gaming audience. Amazon makes a game control for its Fire TV and at least some games from Google Play have been redesigned for its Chromecast TV device. Not everyone who plays mobile and casual games has an interest in moving to the living room. "The games that I play on my phone are because I'm sitting in a waiting room somewhere," says Lori Hanley of Seattle. "If I'm in a restaurant, for example, and I'm waiting for my food to come I'm going to sit and play Solitaire." Yet, even a fraction of the growing global audience for casual and mobile games would be significant. And as customers decide which TV box to purchase — Apple, Google or Amazon — the right game just might make the difference.